Caring for your lawn with proper gardening is an essential task for any homeowner that doesn’t want their garden to be overrun with weeds or simply grow out of control, and it can be crucial during the summer months when you want to be able to enjoy the rare British sunshine in the comfort of your own home. Now that we’re seeing that glorious May sunshine start to appear, we’re willing to bet that getting out to take care of your lawn is fresh in the front of your mind. Maintaining a lawn can become a tiresome chore very quickly, however, with tasks like mowing, weeding, watering and more all activities that not many people can say they genuinely enjoy. That’s exactly why more and more people are making the switch to an artificial grass lawn, but the full benefits of doing that aren’t always obvious. Let us explain at least a few! Well, the first and most obvious benefit of an artificial lawn is the fact that you instantly do away with those previously mentioned chores for good – and no, we’re not exaggerating! With a latex backing that removes contact with the mud beneath and stops weeds sprouting through, the grass itself will stay at the height you bought it and will never grow. It won’t require watering, either, and you’ll find that the free draining design of our grass allows for water to escape after those unexpected rainy spells. That resistance to weather is another massive reason behind the popularity of our artificial grass, as you’re guaranteed a lawn that’ll stay evergreen for years and years to come – even during the infamously taxing winter months. Why not take the first steps towards investing in a low maintenance lawn you can trust to stay that way? We here at Great Grass always endeavour to bring you the very best when it comes to top quality artificial grass you can rely on to allow you to enjoy the summer without tiresome chores. 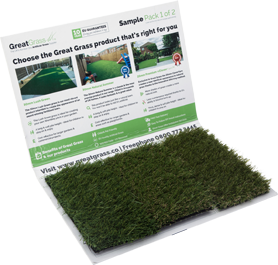 Make sure you don’t wait to get in contact as soon as you can, as we can’t wait to deliver the finest artificial grass straight to your doorstep.